Southeast Texas leaders told state lawmakers on Wednesday that they don't have enough money to carry out major flood control projects on their own. They also advocated for a collaborative, regional approach to flood control. As southeast Texas embarks on the long slog toward Hurricane Harvey recovery, local officials told a panel of state lawmakers on Wednesday that there needs to be a collaborative, regional approach to flood control — and that anything less jeopardizes the state's growth and economic strength. And they said they’re dependent on financial support from the state and federal government to complete key infrastructure projects, some of which have been delayed for years or even decades due to a lack of funding. Their local tax bases, they said, don’t generate enough money to pay for the projects alone. The first order of business, Harris County Judge Ed Emmett told the House Natural Resources Committee, needs to be a flood control plan for the entire state — and the Gulf Coast in particular. The Texas Water Development Board is already in the process of crafting a statewide flood plan with the help of $600,000 state lawmakers gave them earlier this year. Lawmakers haven't yet promised to back any of the projects that end up in the plan. Emmett, a Republican and former state lawmaker, said Harris County intends to put together its own flood control plan in the meantime, add up the costs of its recommended projects and then see how much the federal and state government want to contribute. He said he’ll be the first to push for a local bond package to make up the difference. Emmett said Harris County’s plan will likely include another major dam to catch runoff during storms and relieve pressure on two existing reservoirs, Addicks and Barker. Those reservoirs, which filled to historic levels during Harvey, flooded thousands of homes that may not have been inundated with additional protections. Costello said Texas should also consider creating a multi-billion dollar fund to support flood control projects, similar to one the state's voters approved in 2013 for water supply projects. Russ Poppe, the chief of the Harris County Flood Control District, which for years has studied the feasibility of building a third dam, told the panel of lawmakers on Wednesday that it’s ready to partner with the U.S. Army Corps of Engineers on the project — as soon as it gets funding from Congress. Poppe said the district is also waiting on federal funding to propel four ongoing projects to widen Houston's bayous, many of which breached their borders and flooded entire neighborhoods amid Harvey's historic rainfall. “Harvey was a stark reminder we have a lot of work yet to do,” he said. State Rep. Lyle Larson, the San Antonio Republican who chairs the legislative committee, acknowledged the need for better flood plans — and flood maps. He advocated on Wednesday for an overhaul of FEMA's flood maps, describing them as “antiquated” given how often the state has been hit with storms the agency considers rare. 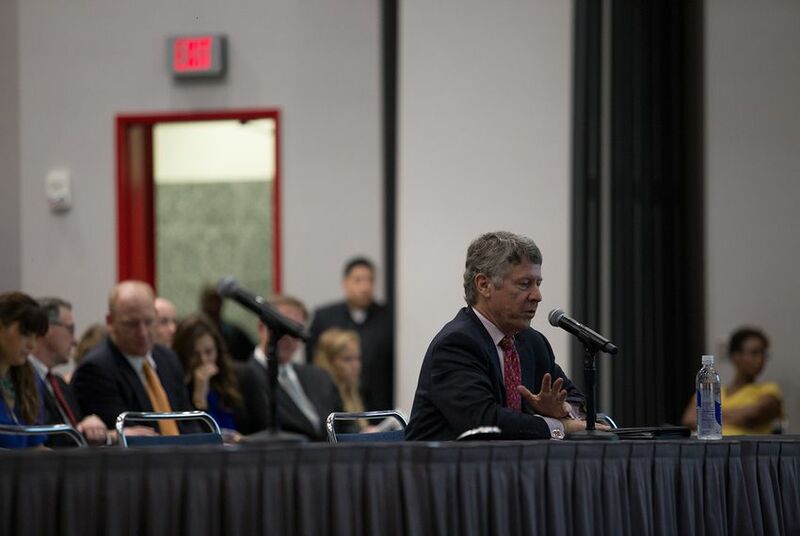 Officials from the Texas Water Development Board reminded the panel that while they’re already in the process of crafting a statewide flood plan, the plan is not yet tied to any state funding for specific flood control projects. They do, however, have hundreds of millions of dollars in loan capacity to help finance them. “We all need to work together to figure out needs,” he added.